Info "Hey! I'm not dinner! Spin the screen so I don't get eaten!" Swamp Swing is one of Wario-Man's microgames in WarioWare: Twisted! 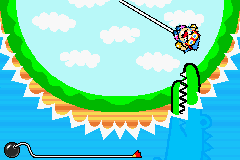 The player must use the Game Boy Advance's tilt to swing Wario around so that he doesn't get eaten by the crocodile in the amount of time allotted. Level 1: A crocodile is trying to eat Wario. Level 2: The rope holding Wario is a bit lower. Level 3: The rope is so low that Wario is almost touching the ground. This page was last edited on September 20, 2018, at 09:32.